A summer vacation can be a great way to spend quality time with family and friends, explore a new city, or just relax at the beach. You don’t have to spend a lot of money to make this getaway a reality, either. With a little planning and research, you can head off on a fun summer vacation and stay within your budget. 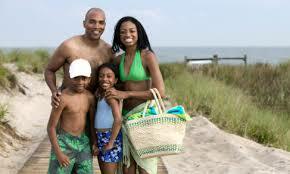 Here are some essential money saving tips that will enable you to enjoy your summer this year. If your family is usually the type to book a hotel room or hit the resorts during the summer, consider roughing it this year. Camping can cost a fraction of the cost of a traditional vacation, and it’s a fun, unique experience the whole family will remember. Check with the National Park Service to find an affordable and safe campsite near you. One of the best money saving tips used by the frugal traveler is to visit a destination that isn’t attracting a lot of tourists. Off-peak season hits ski resorts and lodges, the Caribbean islands (think cruises) and other tropical destinations in the middle of summer. You’re almost guaranteed the lowest hotel and flight deals to these locales during the summer; plan accordingly. Are you a AAA member? Keep in mind that you can save up to 25 percent or more on hotels, tourist attractions and events at hundreds of locations around the country. Hop online to aaa.com to see what discounts and deals are available for members. When you’re booking a hotel or flight package, make sure you check to see if the airline or hotel honors AAA discounts so you don’t miss out on any deals. Online travel sites such as lastminutetravel.com and cheaptickets.com can help you find a better deal when you book your flight and hotel together. Take the time to plot out different dates and destinations that you want to travel to so you can secure the lowest possible rates. In many cases, you can get some of the best rates just by booking a week, or even days, in advance. Many brand name hotels including Holiday Inn, Wyndham Hotels and Resorts and the Ramada Inn offer free accommodations for kids under 12. Other hotels might offer a complimentary breakfast for kids of a certain age; check the “specials” page of any hotel Web site you book to find out if you’re eligible for this offer. Celebrate the season of hotdogs, baseball and relaxing at the beach with a memorable summer vacation. Use any of these money saving tips so you can hit the road without overextending your budget.